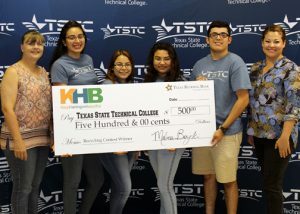 (HARLINGEN) – Thanks to the help of the Texas State Technical College community, the TSTC Student Government Association was able to bring home the win with more than 7,600 pounds of recycled products collected for the Keep Harlingen Beautiful Recycling Contest. SGA was recently presented with a $500 check to use toward other recycling and community service efforts for this achievement. For five years now, Keep Harlingen Beautiful has hosted a recycling contest among the public and private schools of Harlingen, Marine Military Academy and TSTC. From September 1 to March 31, each campus collects newspapers, papers, cans and plastic bottles in hopes of being the campus with the most recycled products at the end of the contest. TSTC currently has 35- and 40-gallon, blue recycle bins across campus, with at least one located in every building, and 135 smaller bins in each dorm room. SGA President Thalia Gutierrez said she is excited about the group’s recent accomplishment and glad others on campus are starting to see the difference recycling can make. TSTC and Keep Harlingen Beautiful have a long-time partnership that has been in place for at least a decade. With this partnership, TSTC has been able to arrange recycle pickup with Keep Harlingen Beautiful and receive funding for major community service projects such as National Make a Difference Day. Community service projects funded by Keep Harlingen Beautiful include park and neighborhood cleanups and the planting of flowers and shrubs along walking trails, parks and canal banks. Volunteer hours for such projects account for at least $8,000, saving the city money and manpower. All recycled material Keep Harlingen Beautiful receives from contests or throughout the year from the community is purchased and all of the money Keep Harlingen Beautiful collects goes back into these beautification projects for the city.